James Cook is Loving my new G35! Mercator is At work. leaving to go work out then a meeting. Tom Harrison says Surprise surprise, the only app on my Mac that continually freezes, crashes, and causes me to slam the desk and curse is Microsoft Word. To tell you the truth I was a little disappointed that only one of the cartographers actually seemed interested in maps. If the cartographers haven't got anything interesting to say then surely the philosophers will have some nuggets of wisdom. Aristotle is Filling out stupid supplements to the common application - why can't they just be happy with the main app?! Again this was not exactly what I hoped to find. With no alternative I turned to the last resort of the scoundrel - religion. All of which proves only one thing. If you want to know where you are going in this world then you need a map. The new sport of sheep spotting on Google Street View continues to grip the world. 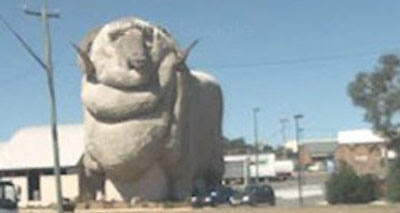 Google Sightseeing has taken a huge lead in the world rankings this week thanks to this sighting of the world's largest ram, 'The Big Merino' which is 15 metres tall! Google Maps seems to be the third most popular Google service after Google Search and Google Image Search. This data is from Compete for the month of November 2008 and counts only unique visitors. Google have been beaten to the draw in providing street view type imagery in Stockholm. 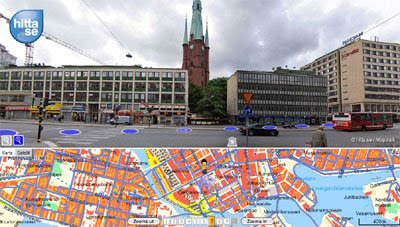 Swedish mapping website hitta.se have teamed up with MapJack to create a 'street view' type experience of the Swedish capital. This is kind of cool. 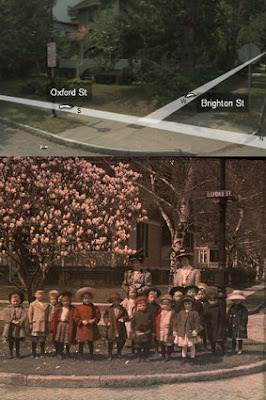 A photo entitled "School children with teachers under Magnolia trees on Oxford Street" on Flickr (lower picture on the right) can be compared to its current street view. Flickr user Pbump worked out where the photograph was taken and found the location on Google Maps. It isn't very clear in the pictures on the right but if you check out the steps leading up to the house in the background you can see that it is the same house. The original picture was taken in 1910. Good resource on that hitta.se streetview functionality. Found it through this site!